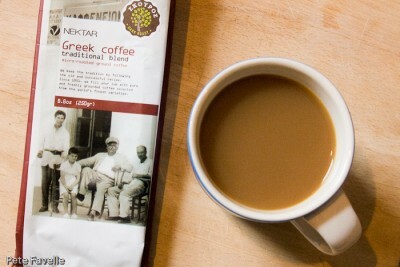 I confess that until recently, I wasn’t really aware that “Greek Coffee” was a thing. I’ve only been to Greece once (I think) and although there was a lot of drinking done I don’t recall any of it being coffee – it was mostly beer, cheap wine and free ouzo. On a side note, never drink free ouzo – it’s worth substantially less than you paid for it. So when my Christmas stocking included this offering from Nektar, I assumed that it was just a style of blend, much like French of Italian coffee. Until I read the instructions. So it’s the sort of coffee that stays in the cup – akin to Turkish coffee, which perhaps isn’t too geographically surprising. 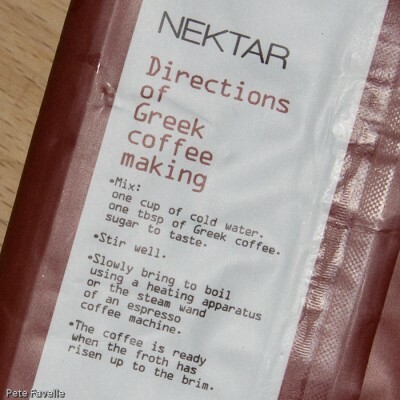 I did try preparing it according to those instructions, but it resulted in something akin to Turkish coffee – namely, more like drinking caffeinated muddy pond water than a tasty mug of coffee. So, plan B was to resort to my trusty Aeropress and pretend that it was nothing out of the ordinary. The trouble with a coffee intended to remain in the cup is that it’s very finely ground, which makes it hard work to get through the Aeropress filter. It does eventually go, but you have to push way harder than normal. The grounds themselves are powdery; there’s a toffee sweetness to the aroma with a backdrop of old spiced wood and a little milk chocolate. Brewed, the old wood aromas really come to the fore along with a deeper spice that reminds me of church incense. In the mouth it’s less exciting. It’s watery and underflavoured, but with a substantial and unruly bitter kick. The spice notes come through in the flavour too, harsh and unbalanced and there’s a distinctly dusty mouthfeel to it too. I’m aware that by making it in my normal way, I’m not exactly following the instructions – but then again, if I made it ‘properly’ then I definitely wouldn’t ever drink it. As it stands, this still isn’t a coffee I’d drink unless I only had some Tesco Value instant coffee left – and even then, I’d think twice. 0.5 stars, which it earns because it’s warm, wet, and about the right colour.